When imagining a new timepiece, BOVET 1822 owner Pascal Raffy relentlessly weighs contemporary interpretation against the Maisonâ€™s historical heritage to ensure coherence and harmony. Considering the watchmaking practice of the Bovet brothers at the dawn of the 19th century reveals how perfectly they mastered traditional watchmaking and the decorative arts of the AcadÃ©mie. At the same time, they expressed a very contemporary and innovative vision, both technically and stylistically. 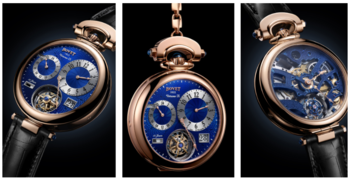 If art and watchmaking experts recognize the work of the Bovet brothers in all its diversity, it is because the common denominator between academic tradition and innovation has always been uncompromising quality, in the service of reliability, chronometry, elegance, and good taste. Pascal Raffy has tasked himself with achieving this same subtle balance in the design of the Tourbillon AmadÃ©oÂ® Fleurier Virtuoso IX. This all-new caliber is housed in a 46.30-mm diameter Fleurier AmadÃ©oÂ® convertible case. A true icon of the Maison, the AmadÃ©oÂ® system transforms the timepiece into a reversible wristwatch, a pocket watch, or a table clock without the use of any tools. Additionally, the Virtuoso IX case is equipped with a fascinating new mechanism, allowing the case back to be opened simply by applying pressure to the crown. The proven ergonomics of the Fleurier case make this timepiece suited for everyday wear. In the same vein, its features and complications will always be of use to the collector, both over time and throughout their travels. The dial is meticulously organized for clarity, yet exudes a unique style. Only the minute hand is centered on the dial. The hour hand is offset at 2 oâ€™clock, and a second hour hand, the 24- hour hand, displays a second time zone at 10 oâ€™clock. Both local time and the secondary time zone thus share the minute hand. A corresponding indication displays the second time zoneâ€™s city name. Two lateral correctors make adjusting and selecting a time zone easy, all while taking into account the differences between daylight savings time and standard time. Logically, a big date indication is included with these complications, positioned on the right side of the dial. Its aperture opens wide without separating the tens from the units. The ingenuity of the Maisonâ€™s watchmakers allows the date to be displayed as big as possible while minimizing the space required for its mechanism. The power reserve indicator sits at 8 oâ€™clock, balancing the big date indicator and notifying the wearer at a glance just how much of the 10-day power supply remains. The timepiece boasts an entirely new face on the reverse side. Though no dial is present, the hours and minutes are centered directly over the complex movement, an unobstructed and view enclosed within sapphire crystal. The openwork bridges evoke the iconic architecture of 19th century BOVET movements, each surface engraved with a sparkling "bris de verre" motif. Once engraved, chamfered, and entirely decorated, the bridges are coated with a blue CVD treatment, which contrasts beautifully with the rhodium plated platinum. This color combination was a favorite of the Bovet brothers usually employed on high polished or finely engraved surfaces. On this same face, those with a keen-eye for detail will notice a circular opening at 12 oâ€™clock that reveals an uncommon mechanism. The twice-patented spherical differential winding system. generates 10 days of power reserve for the Virtuoso IX from a single barrel. This feature demonstrates how the technicians and watchmakers at Maison BOVET have completely mastered the art of power reserve. The drawback of such a feat would be the time required to wind this type of spring. The differential spherical system ingeniously solves this issue by halving the number of turns of the crown required to fully wind the timepiece, without increasing the torque of the winding mechanism. For optimal chronometry, the movement is regulated by the patented double face flying tourbillon. In this innovative construction, the tourbillonâ€™s fixed point is at the center of its axis. Its distribution on either side of the balance-spring and escapement significantly reduces the lever arm effect and improves the chronometry. The variable-inertia balance-wheel is based on the traditional balance-spring made in the Manufacture BOVET 1822 workshops, a science that less than ten watchmakers in the world have mastered. By manufacturing balance springs in house, BOVET 1822 can achieve complete quality control and the best performance possible by perfectly pairing the balance-wheel and balance-spring. Between technical and aesthetic refinement, the bridge carriage alone requires two days of labor to decorate and to round the arms before the faceted sapphire is set. The true face of the timepiece, the dial, is by definition the focal component. With the Virtuoso IX, the Maisonâ€™s dial craftsmen once again showcase the extent of their combined talent. The base of the dial is finely guilloched with a sumptuous fan motif. Eight layers of translucent lacquer are then applied before the surface of the dial is polished. The flinquÃ© dial is bathed in blue tones and highlights, reminiscent of the richness of 19th century enamels. As much for readability as for elegance, the hour contours and second gradations display both a circular satin and rhodium finish. The Virtuoso IX is available in white gold, red gold, or platinum. The Virtuoso IX represents the culmination of two centuries of uncompromising artisanal watchmaking history and art in its noblest form, its ingenuity underlined by four unique patents. In keeping with the technical achievements and classical elegance championd by the Bovet brothers, these innovations serve: comfort, reliability, precision, elegance and aesthetics. After all, at BOVET, innovation has been an tradition since 1822.